Would you want to bike with this? That tiny truck on the right is a logging truck. If you’ve been reading the Eugene Weekly, you may already know that Imperial Oil/ExxonMobil is planning to ship hundreds of tons of oil equipment up the Columbia River, destined for the Alberta Tar Sands in Canada as part of the Kearl Module Transport Project (KMTP). What you may not have realized is that once those shipments reach Lewiston on the Washington/Idaho border they will then be loaded on to gigantic, multi-lane wide trucks weighing upwards of 500,000 lbs and driven on the Adventure Cycling Trans America and Lewis & Clark Trails (Highway 12) through the Idaho panhandle into Missoula, Montana, and beyond. The route directly impacts 175 miles of Adventure Cycling Routes, including the above-mentioned trails, the Great Parks North Trail, and the Great Divide Mountain Bike Trail. I understand that this has little to do with Eugene. I’m writing about it because I’ve ridden the Highway 12 route over Lolo Pass and into Missoula (the location of the Adventure Cycling Headquarters) twice as part of two separate cross-country tours, and it is one of the most scenic and peaceful bike routes that I’ve ever seen. In fact, I’d be tempted to say that it’s the best place I’ve ever ridden a bike. Putting 500,000 lb trucks on this road will destroy the pavement (semi-trucks generally max out at 80,000 lbs), and the infrastructure changes they are planning to do to the roads will open this road up as a permanent mega-shipping route. This is a French company shipping Korean-made products on Dutch trucks to a Canadian work-site, and it will destroy one of our country’s most prestigious scenic byways and flagship bike routes. Take the jump to learn more about the plan, route, and if we can do anything about it. I highly recommend the video at the bottom of this post. Kendra, our esteemed copy editor, left this weekend for a month long tour of the Great Lakes, roughly following Adventure Cycling’s North Lakes Route. She and a friend will start in Scandia, Mn on June 21st and then ride self-supported to West Bend, In – arriving on July 13th or 14th. From there they will take an Amtrak back to Des Moines, Ia where I will join them on July 22nd for a 500 mile bike ride across Iowa as part of Team RoadShow on RAGBRAI. Kendra and I plan to return to Eugene in early August. This will affect the site in a few ways. Most notably our standards for spelling and grammar will likely drop, and the general coherence of my thoughts may also suffer. Also, since we both will be gone for the last week or two of July, WBE posts during that period will likely be even less timely. You can follow Kendra’s trip on her Flickr page, which she will be updating with her phone. Launch Attendees stare - transfixed and amazed! 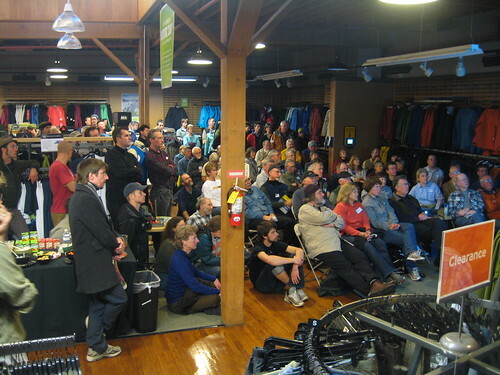 Adventure Cycling held a launch party for their new 2,392 mile Sierra Cascades bicycle route at REI in Eugene on April 8th. Adventure Cycling cartographer Jennifer Milyko presented the new route to a crowded room. WeBikeEugene estimates it was full to capacity with between 50 and 2 million viewers (probably closer to 100.) The route was launched in Portland the night before, and according to BikePortland.org‘s twitter, the event was so full that people were being turned away. Never to be outdone by Portland, we can assume that we probably had more people, and therefor must have a bigger REI. A double win for us! Why did we wait so long to cover this story, you ask? Never one to slack (much), WBE waited until we got our grubby, bike-glove smelling mitts on a stripped-down version of the presentation, so that those of you who missed it can still share in the fun. Take the “jump” for more pictures of the event, information, maps, and an embedded copy of the presentation!